Many seriously injured or ill individuals would prefer to stay in their home homes, but fear that doing so would place an unfair burden on the family members who would have to care for them. Fortunately, professional home health care in Santa Ana CA is available from trusted provider Acacia Home Health Services. Therapeutic, short term, and long term home health care in Santa Ana CA can be provided by Acacia Home Health Services, thanks to our skilled and experienced staff. Physical Therapists: When a patient has difficulty getting around, it can be really hard to visit the physical therapist at a hospital or clinic. Fortunately, we recognize this and we bring physical therapy to patients as part of their home health care in Santa Ana CA. Our therapists can provide exercises to improve balance and mobility as well as to address pain. Social Workers: Because we recognize that a serious illness affects not only the patient, but also the whole family, we include the option of counseling from a social worker in our home health care in Santa Ana CA. Acacia Home Health Services is proud to be a fully licensed and accredited provider of home health care in Santa Ana CA. 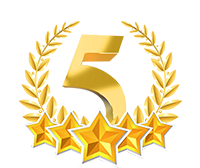 We have earned a 4.5 star quality rating from Medicare.gov. Based on these qualifications it should be clear we are more than equal to the challenge of caring for your loved on in their home. Call us at 818-241-2200 now to learn more about our services.